Buysoundtrax.com presents THE DARK KNIGHT: THE FILM MUSIC OF HANS ZIMMER VOLUME 3 (2004 – 2014), a brand new compilation of music from celebrated composer Hans Zimmer. 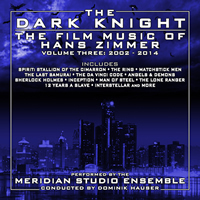 Faithfully produced and arranged by Dominik Hauser, performed by the Meridian Studio Ensemble, THE DARK KNIGHT RETURNS features selections taken from the composer's filmography produced during 2004 through 2014, including music from SPIRIT: STALLION OF THE CIMARRON, THE RING, MATCHSTICK MEN, THE LAST SAMURAI, THE DA VINCI CODE, ANGELS & DEMONS, SHERLOCKS HOLMES, INCEPTION, MAN OF STEEL, THE LONE RANGER, 12 YEARS A SLAVE, INTERSTELLAR and More. Beginning with a series of early 1990s action films, BLACK RAIN, DAYS OF THUNDER and BACKDRAFT, composer Hans Zimmer quickly made a name for himself as one of the most influential and in-demand composers for blockbuster action movies. During the time period covered in this collection, director Steven Spielberg personally picked Zimmer to head up the music department of his Dreamworks production company, and Zimmer tackled many of the studio’s major releases. With his muscular, anthem-like themes and orchestras supercharged by layers of synthesizer textures imposed over acoustic sounds, Zimmer created a new way of scoring Hollywood action movies and animated films. Despite his enormous success with blockbusters, action films and franchise entries, Zimmer also found opportunities to demonstrate an original ability to score more intimate and character-driven projects with great emotion and dignity over the years. 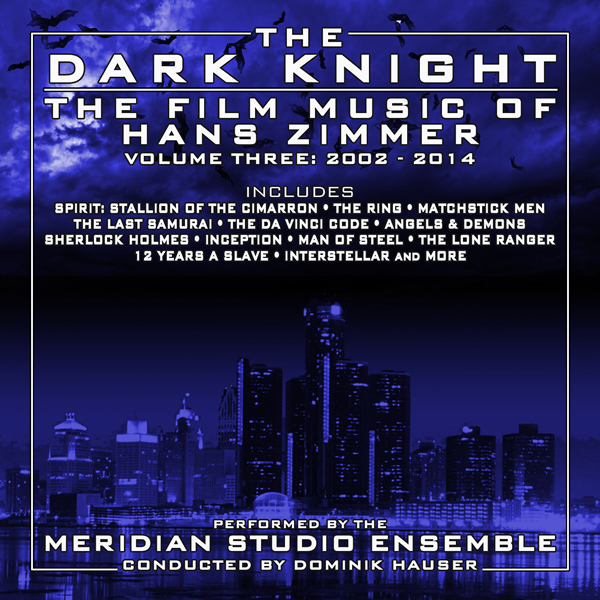 THE DARK KNIGHT: THE FILM MUSIC OF HANS ZIMMER VOLUME 3 celebrates the composer’s work during this decade.